Hey everyone! 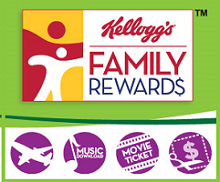 Hope you are enjoying all these free codes that Kelloggs Family Rewards has been providing lately. How fun to think that just by entering these codes, you can get some cool rewards! :) Here is a new code that was released yesterday and it is worth 25 points. Are ya ready? Here it is!